A lunch time Kick off at Old Trafford with a different flavour, it wasn’t the Red Devils running onto the pitch, instead Japan and Egypt strolled onto the field for their quarter final game in the London Olympics; an Afro-Asian tussle of epic proportions awaited a raucous and impressive crowd of 70,772 . A bright start from Japan forced Egypt onto the back foot early on. Japan settled into a rhythm and that early pressure yielded a deserved goal after Nagai latched on to a delightful ball from Kiyotake and turned el shenaw to slot home. Egypt responded and applied pressure, but couldn’t fashion any really threatening chances, and just before half time Japan broke on the counter which led to Samir clumsily bringing down Saito on the edge of the box and being sent off. Thus the half ended with Egypt a man and a goal down to an impressive and disciplined Japan side. 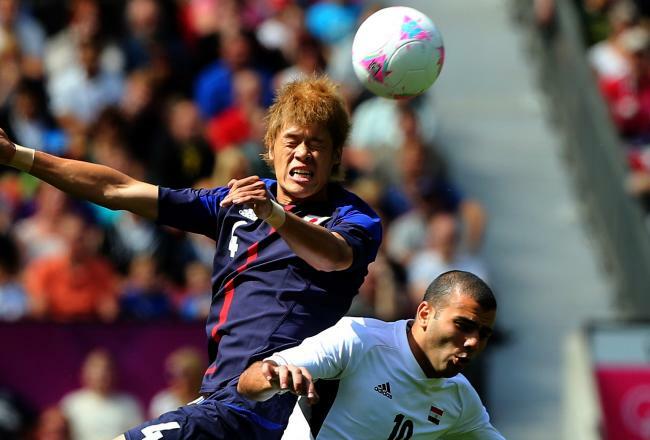 The second half started slowly and it took Egypt a while to realise they were on their way out of the tournament, by then however it was too late and Japan exerted further control on the match by scoring a second through their captain Yoshida, who powered home a header from a free kick. Hegazy then went off injured for Egypt who had already made all 3 substitutions and it went from bad to worse for the Egyptians. Japan were in complete control and Otsu provided a 3rd goal for the Samurai Blue who coasted to victory and perhaps could have scored more. The only downside to the Japan win was striker Nagai coming off with an injury after Hegazy clattered into him as he scored, hopefully this will not be the end of the tournament for the gifted player. Exciting times for Asian football, Egypt will be disappointed with their lack of drive. Japan meanwhile will be setting their sights on making the final, and possibly, just maybe, winning it. Asian football has been impressive on the world stage of late, but when will the deserved international recognition and interest finally come?